When I started consulting seventeen years ago, I asked one of my mentors who was a very successful businessman to share with me what characteristics he felt made a successful consultant. One of the qualities on the list was "intellectual curiosity: the ability to abstract". While this is a critical aspect of being an effective consultant, we find it to be just as important to apply to being an impactful leader in any industry today. Look outside your industry and your situation. Pay attention to innovations, regardless of type or source, to explore new possibilities. Study work habits and communication of students or future generations of workers or customers. Explore emerging products or services in other markets or geographics. Evolving in how we work, serve, sell, or grow starts with cultivating intellectual curiosity personally and within our teams. But it doesn’t stop there. What I find most interesting about my mentor’s note is that it’s not just about being curious (new ideas or interesting things you see, read, or experience) it’s also about what you do with it. How do you take the next step to draw abstract value from the learning? Once something draws your attention, take the next step to ask yourself how it might impact your organization, industry, customers, and people. Better yet, challenge yourself to discover how positive change can be brought to your organization and beyond. It’s invigorating to explore the art of possibilities, even if it feels a little “out there”. 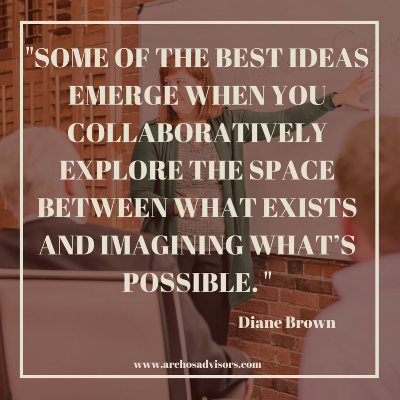 Some of the best ideas emerge when you collaboratively explore the space between what exists and imagining what’s possible. Beyond leading by example by being intellectually curious and abstracting, great leaders also cultivate curiosity by creating a culture in which it can thrive. They hire people who are curious. They inquire about the observations of others, regardless of level or role. They encourage and are open to thoughtful questions. They challenge assumptions and welcome others doing the same, and they recognize and reward curiosity. To capitalize on opportunities to evolve, consider how you are leading by example to cultivate, use, and promote curiosity both within and outside your world. Newer PostIs Cognitive Dissonance Hurting Your Team Development?